The Bush administration continued to press for a "sustainable" peace in the Mideast, while Israeli jets continued limited bombing runs despite an informal 48-hour cease-fire. "The Security Council postponed the planned session on troop contributions for an international force in Lebanon, first for a day, and now indefinitely, pending Secretary of State Rice's proposed package that will be presented this week or next," said CBS News foreign affairs analyst Pamela Falk at the U.N. "Without some sense of a cessation of the violence, the fear is that any international force will be caught in the crossfire." The European Union said Monday it is confident the Council will be able to reach a decision on a cease-fire in southern Lebanon this week. But Israeli Prime Minister Ehud Olmert said Monday that no cease-fire was imminent. "Israel continues to fight," he said. "We are determined to succeed in this struggle," he said. "We will not give up on our goal to live a life free of terror." President Bush again insisted Monday in appearances in Miami that any Mideast cease-fire be accompanied by a wider agreement. "We want there to be a long-lasting peace, one that is sustainable," he said after a meeting with Cuban-American business leaders in a Miami restaurant. "I assured the people here that we will work toward a plan at the United Nations Security Council that addresses the root causes of the problem, so that whatever comes out of the Security Council will be able to last and that the people of Lebanon and Israel will be able to remain in peace." Later, in a speech at the Port of Miami, he added, "It is important to remember this crisis began with Hezbollah's unprovoked terrorist attacks against Israel. Israel is exercising its right to defend itself." Hezbollah's Al-Manar television claimed that guerrillas hit an Israeli warship off the coast with missiles Monday. The Israeli military denied the claim. The White House referred questions about the claim to Israel. Secretary of State Condoleezza Rice said Monday that Israel's attack on a Lebanese village complicated her diplomatic push in the Middle East, acknowledging that there is "a lot of work to do" to bring about a lasting cease-fire. An Israeli military spokesman told CBS News the air force was providing cover to ground forces near Taibe in southern Lebanon. The Israelis feel that doesn't violate their pledge to stop the bombing for two days. Hezbollah guerrillas attacked an Israeli tank in southern Lebanon, wounding three soldiers, the military said. The attack occurred near the villages of Kila and Taibe on border, where Israeli ground forces have been fighting Hezbollah guerrillas for nearly two weeks. U.N. and Red Cross aid convoys were forced to turn back from destinations in Lebanon on Monday because of continued fighting between Israel and Hezbollah even as other trucks pressed on in an attempt to reach the besieged southern town of Qana, officials said. 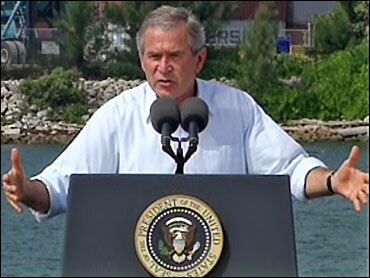 But in a speech at the Port of Miami, Mr. Bush outlined steps he said are necessary for a long-last cease-fire: Respect for Lebanon's sovereignty, a cut-off of support for Hezbollah by Iran and Syria, the return of Israeli soldiers taken captive by Hezbollah and Palestinian militants, and an end to Hezbollah rockets being fired into Israel. "The current crisis is part of a larger struggle between the forces of freedom and the forces of terror in the Middle East," President Bush said.